Injured Sunderland forward Duncan Watmore has been "given a lift" after Real Madrid sent a letter of support to the player. The 23-year-old is facing another lengthy spell on the sidelines with knee cruciate ligament damage just weeks after returning from 10 months out with a similar problem. "If he was a world famous player maybe you'd expect it. It was totally out of the blue," Watmore's father Ian said. "What an incredible gesture," he added. The former FA chief executive tweeted about the letter on Tuesday. Signed by Emilio Butragueno, Real's director of institutional relations and former striker, the letter reads: "Dear Duncan, On behalf of our president, Florentino Perez, and those who work for Real Madrid, we would like to wish you a smooth and speedy recovery from your knee injury." Watmore returned to action against Preston in September having been out since the start of December last year. His comeback lasted only six games before he suffered a recurrence of the injury in the 2-2 draw with Millwall on 18 November. Ian Watmore told BBC Sport: "To get the letter was a total surprise but what an incredible gesture from a very classy club. "It has given Duncan a real lift. He sent me a picture of it on WhatsApp as he left the training ground and I asked if I could tweet it. The reaction has been great. "His situation is just awful really. We don't know how long he will be out this time but I would be surprised if he is back before September or October next year." The letter was signed by Real's Director of institutional relations, Emilio Butragueno, who played 341 times for the club as a striker. Shortly before his injury Watmore became the first Championship footballer to sign up to Juan Mata's Common Goal charity, pledging one per cent of his salary to good causes over the course of his career. "Mata's charity is followed very closely by the Spanish media, so I suspect Real Madrid have picked up on what happened to Duncan that way," said Ian. "Either that or Chris Coleman his manager has said something to Gareth Bale through their relationship at the Wales international level. "But for the club to think of him and send a letter is wonderful." Former England Under-21 international Watmore has now had a second major surgery on his knee and is beginning the lengthy rehabilitation process at Sunderland's Academy of Light training ground. "It happened through a freak accident," said Ian, who is also a former senior government civil servant and a board member of England Rugby. "It's not an inherent weakness in the knee. "It was just one of those weird footballing things that can happen. The same surgeon who rebuilt his knee last year has already operated again. "Duncan came through England Under-21s with players like Ruben Loftus-Cheek, Will Hughes and Jordan Pickford. So while they're all emerging on the Premier League scene he's stuck in the slow lane again, which is very difficult for him. "But it doesn't help mentally when you think about what could have been. You have to deal with the situation as it is and Duncan is good at that." 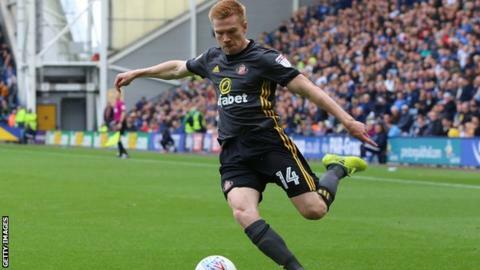 Watmore has two-and-a-half years remaining on his deal at Sunderland, and Coleman has vowed that the Black Cats will "take care of him no matter how long it takes". "He still has time to prove himself," said Ian Watmore. "He is in the best hands and Sunderland have been fantastic."